There were flecks of gold in his eyes, which were the color of a Luna Moth’s wing. And there was a sinuous red thread, a tiny vessel that ran from the green of his iris, across the white, through his beautiful mind, and on to his heart. And he could see things that were not there. “No it’s not. It’s a lamp,” the older, wiser, new five-year-old friend insisted. And I nodded, elated, because we saw the same things; but, concerned, because this world is a hard place for those who imagine things that are not there. I knew this. And, I knew his was the only soul I’d found in this world like mine, so I had to protect it. I watched over him, and shadowed him, while he searched for and discovered treasure, learned and collected things. I watched his funny shows, and listened to his words, his fanciful stories. I listened for his breathing when it was too quiet. And I ran to him when he cried, noticing how tears magnified that vessel in his eye. I looked in on him at night while he slept, and noted the movement of his chest, and sniffed the scent of his skin, the sweat in his hair, which smelled sweet, fragile. I needed to protect him. Because there was something. I couldn’t see it. I felt it, knew it in my heart, but I couldn’t see it—that thing looming in his heart. I was wolflike, vigilant, alert, always sniffing the air for scents of danger. I was afraid…that delicate thread, that tiny vessel, might snag and unravel everything. The Arctic Tern weighs about 2/3 of a pound, and measures 12 to 15 inches long. It has a white, forked tail, a black cap on its white head, and a red bill, an accent color, and tool for fishing. Tern colonies breed in the Arctic Circle. They lay eggs in grassy areas and both parents care for them. The colony then flies to the edge of the Antarctic ice pack. Its days are long and sunlit from one hemisphere to the other. The Tern spends each of its 20 years of life, flying the earth’s circumference. “Dread,” is the sudden silence that follows the noise of a socializing Tern colony, right before they take to the air and fly away to begin their migration, the longest migration of any bird. He was extremely creative, and loved art class. 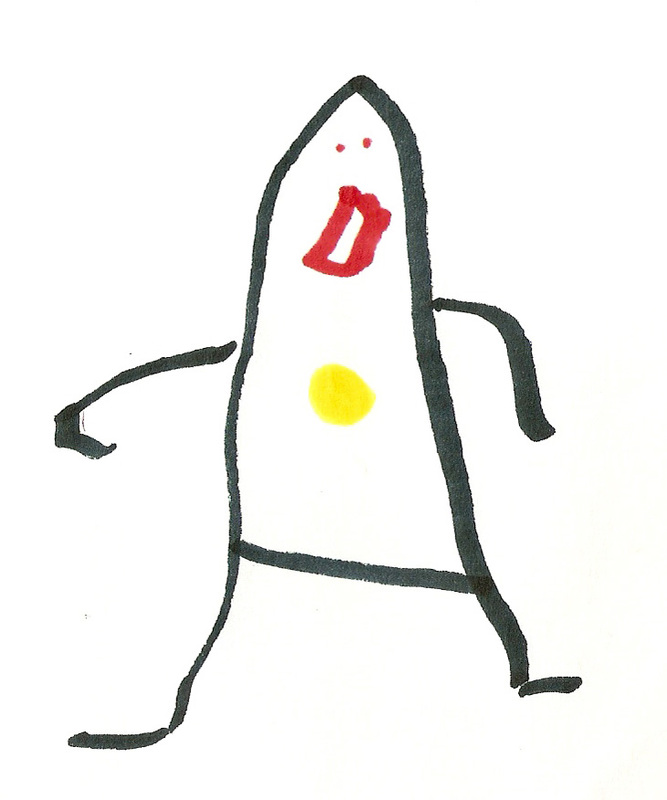 In kindergarten, Sam studied famous artists—Vincent van Gogh, Pablo Picasso, and Claude Monet—and their techniques. He created the bird (above) in the style of Picasso’s line drawings. 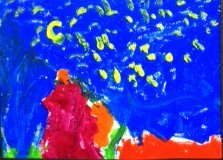 And painted this scene (below), trying to emulate van Gogh’s Starry Night. For his first research paper, he wrote about the Arctic Tern. Researching, gathering index cards of information, and writing neatly was somewhat stressful for him. I remember how he sat at the kitchen island, worrying about finishing on time. Too much for a six-year-old, I thought. When he should be outside playing. But he’d officially become a student, and first grade was approaching. The real world of assignments, tests, essays, and homework had arrived. It was a transition for us both. I’m writing you for additional assistance in placing my son, Sam, with a teacher that you feel would be equipped to handle information regarding his health. I may seem a bit over protective, but in light of our past year with the discovery of Sam’s mysterious heart condition, any little bit of reassurance helps me. I trust you will know the right teacher to take good care of Sam when he’s out of my watch. Sam continues regular checkups and monitoring and is currently going through further testing. There may be times during the school year in which he will have to wear a holter monitor. He’s familiar with these tests, but becomes self-conscious around his peers. A teacher sensitive to all of this would really be great. David and I have had a worry-filled year with the knowledge that we carry around. I’d be more specific if we had a diagnosis/prognosis; we still don’t. Sam understands that he has a “dot” in his heart and that we are continuing to better understand what this dot means. Otherwise, Sam is a healthy, happy, smart and sensitive little boy, and shows no outward signs or symptoms except having less stamina than normal. As you and his teacher will find out, he’s well ahead of his years in maturity. He’s got a great sense of humor and has a heart of gold. Thank you in advance for being so kind in our conversations and for understanding a unique situation. I, and especially Sam, look forward to meeting his new teacher at Beauclerc Elementary! He was beginning to fly out into the world. And I was learning to let him. But in those hours of the day when he was away, who would watch him, his heart, the way I did? I had to rely on teachers, coaches, administrators, lunch room monitors, bus drivers, substitute teachers, and friends…to be my eyes. The silence of the separation from him during the day was, for me, filled with dread. Each time I’d leave him at school, dread was in the silence while leaving the carpool line, or in the quiet while folding laundry back at home. It was in Joey’s questions while we played or ran errands. “Where Sammy? Mama, where Sammy?” he’d repeatedly ask. “He’ll be home soon,” I’d repeatedly answer. It was in the tightness below my heart, and in that sick feeling above my stomach. It was in the adrenaline that dripped continuously into my blood. It was in every ring of every phone call, the dread. We were a family of four, framed in a picture, or in a restaurant window, talking wildly with our hands, and laughing. 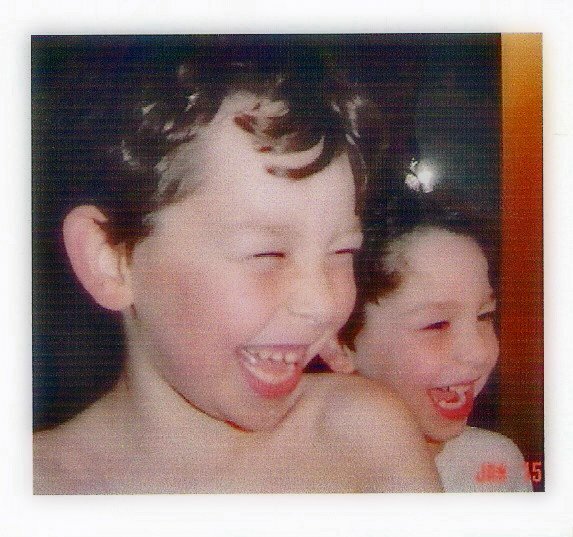 That was the best part…the laughing. April 7, 2007. It was a typical Saturday night. We went out to dinner to our favorite Chinese restaurant. The restaurant hostess smiled and held up four fingers. And I nodded, Yes…Four. David and I, and our two wavy haired boys, Sam, nine, and Joey, almost seven, followed her to our usual booth. And then, we agreed on our usual order: chicken salad wraps for an appetizer, and walnut shrimp, honey garlic chicken, a bowl of steamed rice, and a bowl of fried rice that we’d all share. Everything was okay, I reassured myself. But everywhere we went—anywhere, anytime—there was imminent danger. The threat of death followed us, even when we went out to dinner. So a small unit of tiny soldiers always accompanied us. G.I. 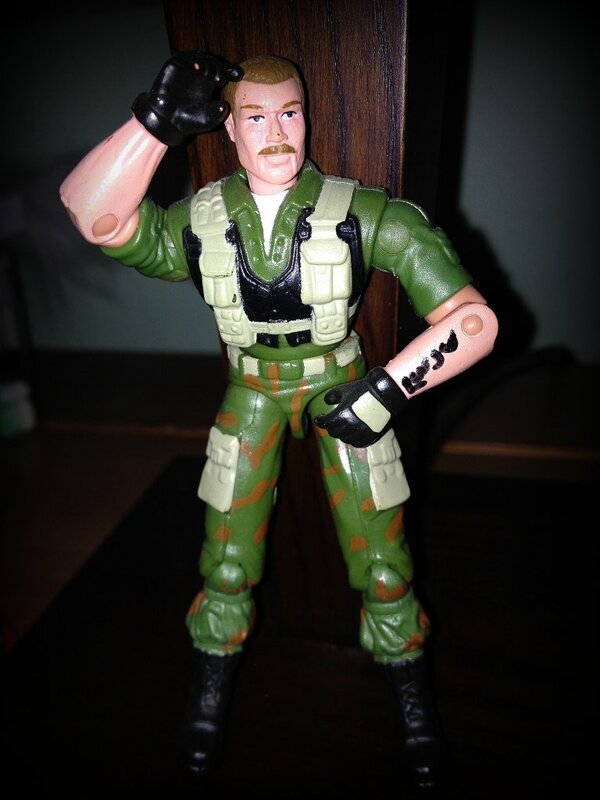 Joe action figures, with movable—“supposable”—joints for maximum motion and pose-ability. Tiny giants with 6-packs, serious eyes, painted hair, and tattooed guns. Sam’s favorite was Duke. Joey’s hero was Snake Eyes. While we ate our appetizer I studied the boys’ profiles in the mirror that flanked our booth. Memorizing the shape of their full, round cheeks…the cuteness in the way they bit the crisp oversized pieces of lettuce…the dogged way they lapped up stray bits of meat that kept dropping from their salad wraps…the delightful sounds of their chewing—their satisfaction. The walls on both sides of the restaurant were covered with mirrors. I looked into the reflection of our reflection across the room, and saw that we went on and on. A chorus line of hands and arms, kicking up and down from plates to mouths. After dinner we ate our cookies and compared our fortunes. “Mine says, ‘Courage is not the absence of fear, it is the conquest of it,’” Sam announced. Just when the waiter returned, smiling, with a gift for each of the boys—a scroll attached to a bamboo stick. The boys quickly unrolled their prize, a Chinese calendar with the years of the animals on it. “I was born the year of the tiger! I’m ‘Courageous, Magnetic, and Unpredictable!’” Sam declared. I checked Joey’s calendar and pointed to the year he was born. “You were born the year of the Dragon,” I told him. “You are ‘Intelligent, Powerful, and Lucky.’ And look, Daddy was born the year of the Ox.” I refrained from making a joke about this. A merry heart does good like a medicine, I smiled to myself as I read my fortune, then pushed it into a pocket inside my purse. Back at home base, the boys were getting ready for bed. Standing together in the bathroom mirror, concentrating, brushing their teeth. “Joey, did you go pee?” I checked. He nodded as he lumbered into his room. “He did. I saw him,” Sam confirmed over his shoulder as he pattered in the other direction. The Jack and Jill bathroom was shared space in between the boys’ bedrooms. The walls around the sink and tub were painted blue to match Joey’s room. The walls around the toilet were painted green to match Sam’s room. Everything was divided equally, even favorite colors. Blue towel, blue toothbrush on one side, and green towel, green toothbrush on the other. And their beds were close, separated only by the hallway-like bathroom; so they could see each other, like a reflection, and talk. “Goodnight, Sammy,” Joey said, like a prayer, before his head hit the pillow. Like most nights, Joey was snoring in seconds. He had two positions—vertical or horizontal, and two speeds—fast and furious, or fast asleep. Sam was different. He’d play war games with action figures, or read, or listen to music for a while before falling asleep. I tucked him in and listened while he debriefed Duke: “We win battles together. We fight our fear of the dark with courage. We have soldiers’ hearts. Big brave hearts.” He set his hero on the nightstand, the watchman whose eyes never closed.